This chapter covers different ways to find information you've stored in CiviCRM. Two of the techniques in this chapter - finding contacts and the "search-action" workflow, described in the second bullet below - are core functions in CiviCRM, so most, if not all, users will find this chapter helpful. We will start off with some simple searches and then move on to more advanced techniques. CiviCRM beginners should be familiar with Quicksearch, Advanced Search and the component searches. More advanced users should also look at reports, custom searches and Search Builder. To perform an action on a contact or contacts that meet certain criteria: a common workflow in CiviCRM, called a search-action, is to find contacts that meet certain criteria and then perform an action on them. For example, you might want to find all contacts in the advisory group in order to invite them to a meeting, find all those whose memberships have recently expired to send a renewal reminder, or find all contacts aged under 25 in a specific location to send them an email about an upcoming event nearby. As a form of ad-hoc reporting, searching is often useful but does have limitations. For example, you can't group results by particular criteria, summarize, or easily produce graphs of the results. For more advanced reporting, see the CiviReport section. The easiest way to find a specific contact is to use the Quick search box that appears in the navigation menu at the top left of the screen. You may choose to search by one of several criteria. 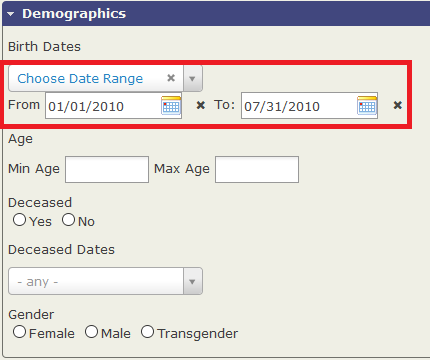 The criteria can be modified by going to Administer > Customize Data and Screens > Search Preferences. 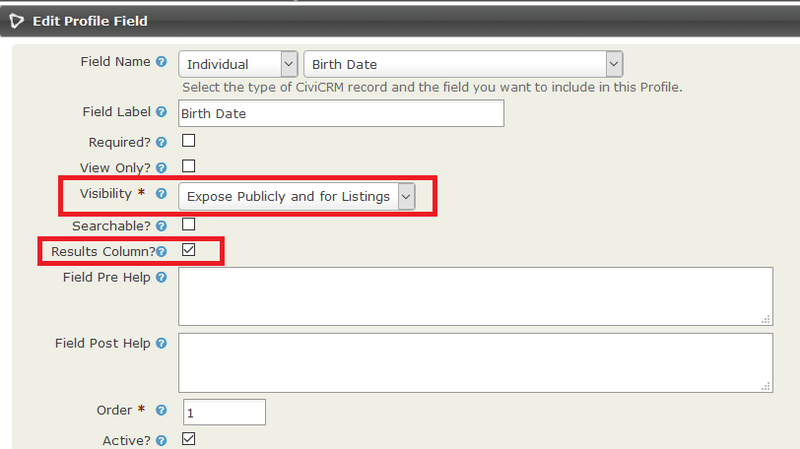 On the Search Preferences page, options are available to customize CiviCRM's QuickSearch to hide contact's basic fields that are not normally used in a quicksearch and to add custom field options. organisations with Peter in their name, e.g. Alpeter Community Centre. You often don't need to type the full name of the person - just the first few letters. However, if you don't see the contact you are looking for, either refine the search by typing more characters, or hit the 'Return' key to convert your search into an Advanced search. Quick search displays up to 10 results (by default). You can change the number of results returned from the Search Preferences screen described above by changing the Autocomplete Results setting. CiviCRM also allows for the collection of a nickname when entering new contacts. For example, "Joe" can be a nickname for "Joseph" and "IBM" can be a nickname for "International Business Machines". When you first install CiviCRM you will find "Joseph" when searching for "Joe" and you'll find "International Business Machines" when searching for "IBM". You can change this behavior from the Search Preferences screen described above by changing the Include Nickname setting to yes. If you search by phone then you will need to enter the digits of the phone number without any formatting. The phone search is done against a field that consists only of digits with all non-numeric characters stripped out. If you want to search by first and last name, use the format "Lastname, Firstname", not "Firstname Lastname". For example, "Peterson, Mary" not "Mary Peterson". Advanced search allows you to search across all the information you have about your contacts. For example, you could find "all contacts in Venezuela" or "all advisory group members". If you specify two or more categories of information, the search displays every contact that matches all the categories. For instance, you can combine the two criteria just mentioned to find "all advisory group members in Venezuela". Advanced Search returns your results as Contact records by default. However, you may want to get another record type instead. For example, you may want to search on the Membership renewal activity to find everyone who renewed their membership last week then display the results as Memberships so that you can export name, address and Membership expiration date to create and then post out membership cards to those contacts. Simply select the record type you want from the Display Results As dropdown. Read more about creating profiles in the Profiles section of the chapter on Organising Your Data. Most CiviCRM components offer a search on the data they maintain, such as Find contributions, Find members, etc. These forms work in a similar way to Advanced search but return rows of the main objects associated with the components, instead of contacts. Find Members returns memberships, Find Participants shows event registrations, Find Contributions returns contributions and so on. Which states or provinces are available in the search depends on your localization settings. Add additional countries by going to Administer > Configure > Global Settings > Localization. 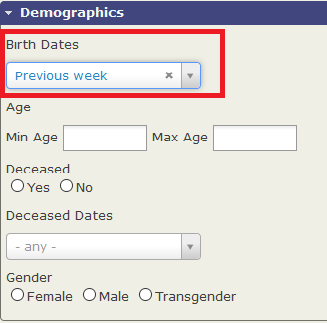 Add to the column of "Available States and Provinces", but note this change will also affect profile forms which include country or state/province fields. Search for contacts located within x miles/kilometres of a specific geographical area. Enter the distance in miles or kilometres. 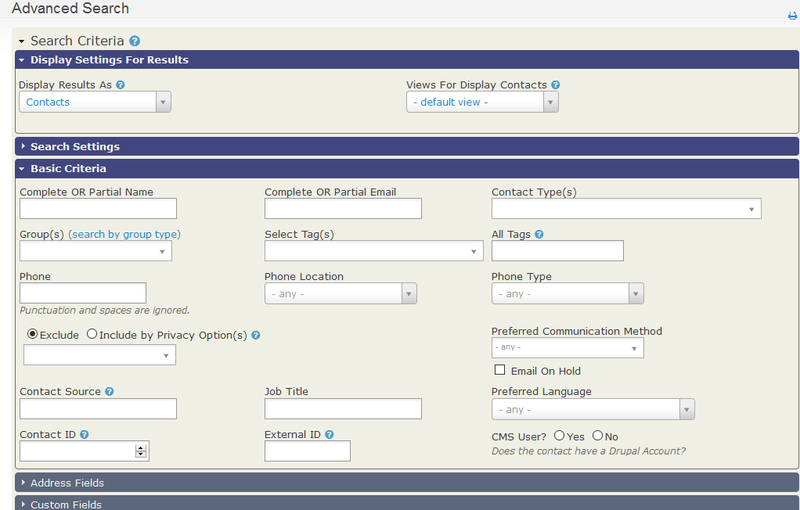 You can also incorporate Proximity Searching in a profile which you've configured for use as a search form. It is possible to write your own custom searches, but you'll need to be comfortable with MySQL and PHP. See the Developer wiki at http://wiki.civicrm.org/confluence/display/CRMDOC/Develop for more information about how to do this. If you create a custom search that you think could be useful for others, consider contributing it back to the community. Understanding wildcards greatly expands your search options. A wildcard represents any character (letter, numeral or punctuation mark). In CiviCRM, the wildcard is represented by the % symbol (you may be familiar with other symbols such as * from other applications). It is most easily understood through examples.